Reggie Bush Cheating With January Gessert? There are rumors circulating around the web that the reason for the recent break up between Kim Kardashian and Reggie Bush was due to his cheating ways. According to Radar online, Reggie's alleged mistress is a waitress named January Gessert that he met on Sunset Strip. Kim Kardashian’s on-again off-again boyfriend, Reggie Bush, is the latest star to become embroiled in a cheating scandal, after being linked to January Gessert. Gessert reportedly spent the night at Reggie’s house on March 16th, after the two met at Sunset Strip bar-restaurant Red Rock. 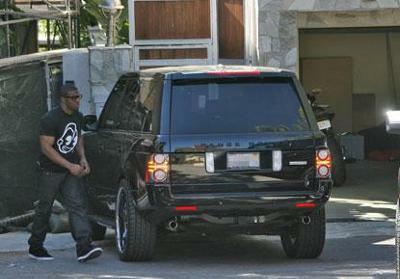 She was spotted leaving Reggie’s house the next morning at 7am. Now RadarOnline.com can bring you the world exclusive photos of the pretty blonde waitress and the New Orleans Saints Football star. Reggie has reportedly set up an elaborate system to hide his cheating from Kim - including the use of multiple cell phones, but the camera never lies, and Kim is bound to be left devastated and in tears following the release of these photos. The photos featured on Radar Online depicts January (January Gessert Photos)leaving Reggie's house early in the morning. Then it shows Reggie leaving and implies that it is shortly after she leaves. Do you think these allegations are true? If so, do you think it is over for good between Kim and Reggie?